Take the pain out of gardening! If you’ve been using regular scissors to trim, shape or prune then it’s time for you to say goodbye to aching wrists, hands and blisters! ultra-fine point for even the most delicate pruning tasks. Designed with gardeners in mind. Titanium coated blades extend the life of the solid stainless steel beneath it and reduce residue build-up. A built-in safety lock keeps these super sharp blades securely closed until you’re ready to open them. Our spring is sturdy and durable, meant to last for years of long trimming sessions. A rubberized grip adds to your overall comfort while using this lightweight, precision-honed gardening tool. 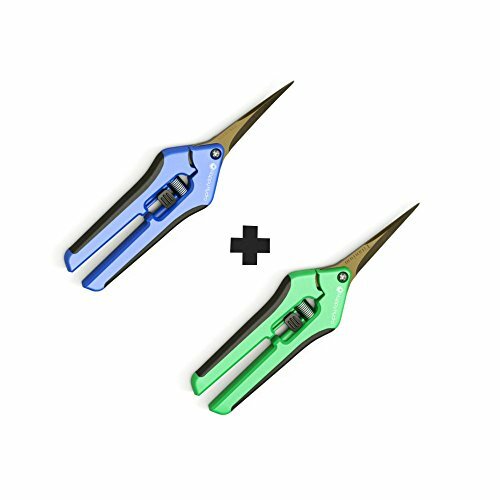 The lightweight design and precision point blades of our gardening scissors make them ideal. Prune herbs, flowers, vegatables, and houseplants quickly and easily. Durable and corrosion resistant, you can count on a sharp blade and consistent cutting for years. At Happy Hydro, we stand by every product we sell so you can purchase confidently. STRAIGHT & CURVED TIP COMBO allows you to switch between two different types of blades with different uses. TITANIUM COATED BLADE is built to last no matter what you are trimming. Rose bushes, floral arrangements, vegetables, herbs, or bonsai trees, our scissors will stay sharp and keep you trimming. BUILT-IN SAFETY LOCK keeps the razor-sharp blades securely closed until you're ready to trim, prune, snip, and "deadhead" those flowers. Makes for easy and safe storage in toolboxes, grow rooms, garden sheds, and greenhouses. CORROSION-RESISTANT stainless-steel blades will maintain a razor-sharp edge for years of clean, rust-free, and consistent cuts. Gardening pleasure in all outdoor gardens, greenhouses, hydroponic gardens, and grow tents. COMFORT GRIP HANDLE reduces hand fatigue during use and is ideal for gardeners with arthritis or those with restricted hand strength. Great for long trimming sessions! If you have any questions about this product by Happy Hydro, contact us by completing and submitting the form below. If you are looking for a specif part number, please include it with your message.